Who says Taco Tuesday always has to mean Mexican flavors? You know I love me some Mexican, but it’s fun to change it up sometimes. Still need convincing? 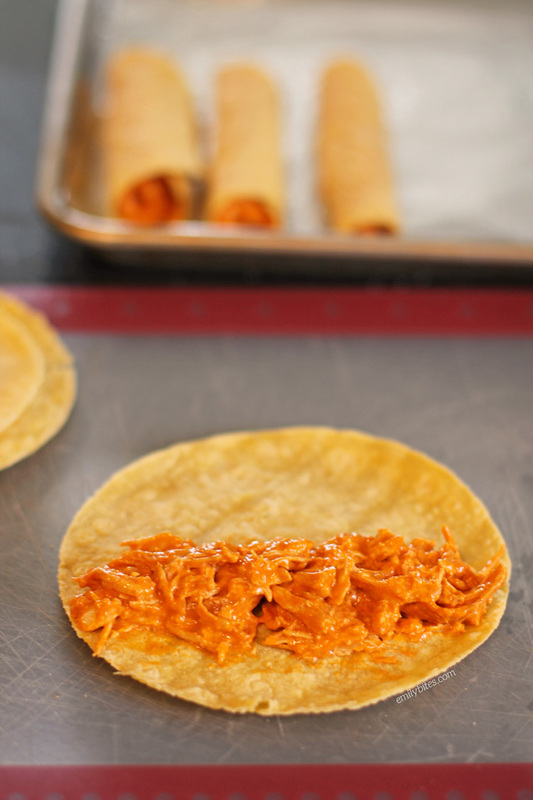 These Buffalo Chicken Taquitos are the perfect opportunity to give your tacos a spicy Buffalo makeover, and once you take a bit I’m certain you’ll be sold. The kickin’ Buffalo chicken is perfectly balanced with cool cream cheese and blue cheese dressing and baked together into crispy corn tortillas. I love eating these for lunch, a snack, dinner or serving them as handheld party food when we have friends over. They’re filling and tasty and always a crowd-pleaser. 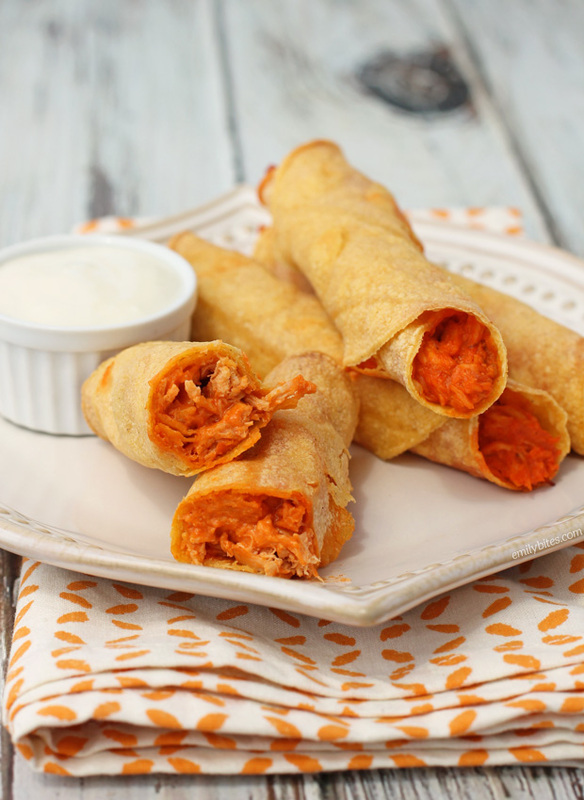 If you like some of my other tasty handheld recipes like my Pizza Logs, Spicy Beef Taquitos or Enchilada Cheese Rolls (or if you’re a Buffalo chicken fanatic like I am) then be prepared to love these Buffalo Chicken Taquitos. You can even skip the stovetop for Summer and make your shredded Buffalo chicken in your slow cooker if you prefer. I served these with additional blue cheese dressing for dipping and I highly recommend it. For just 119 calories or 2 Weight Watchers SmartPoints, it’s easy to work these taquitos into your meal plan and feel like you’re indulging (but lightened up)! Pre-heat the oven to 400. Line a baking sheet with foil and then lightly mist it with cooking spray and set aside. In a large skillet or sauté pan, bring the oil to medium-high heat. Add the chicken breasts in a single layer and cook for 3 minutes on one side, flip them over, and then continue to cook for 3 minutes on the other side. Add the Buffalo sauce to the pan and wait until it bubbles (should happen almost immediately. Lower the heat to medium-low and cover the pan. Simmer for about 15-20 minutes (depending on the thickness of your chicken breasts) until the chicken is fully cooked through. Remove the lid from the pan and transfer each breast to a cutting board, shredding it using two forks and then returning it to the sauce. When all the breasts are shredded, stir them into the sauce until thoroughly combined. Continue to cook for 3-5 more minutes until the sauce thickens and soaks into the chicken. Transfer the chicken to a mixing bowl and add the cream cheese and blue cheese dressing. Stir together until cream cheese melts in and the ingredients are well combined. Place about half the tortillas between two paper towels and microwave them for 30-60 seconds until they are warm and pliable. Place a tortilla on a clean, dry work surface and then scoop two tablespoons of chicken filling onto the bottom third of the tortilla. Roll the tortilla up from the bottom to surround the filling and once it’s rolled into a tube, place it on the prepared baking sheet, seam side down. Repeat steps with the remaining ingredients (including microwaving the other half of the tortillas when you get to them). Place the baking sheet in the oven and bake for about 15 minutes until tortillas start to get golden and crispy. I just recently started following your blog after stumbling upon your instagram. These look ah-mazing!! I LOVEE taquitos! Especially this non-mexican kind you’ve created! Bravo! These were so awesome! And so easy to get together. I even did it one handed with a newborn in the other hand. Haha, that is some skill! 😉 I’m glad you loved them! Have you ever tried freezing these and reheating in oven? This would be an awesome make ahead snack if that worked I may try it with one of the left overs if I can control myself from eating all of them. I have not tried it – let me know how they turn out! These were so good but all my tortillas split open in the oven….I did warm them in the microwave first and used the thin ones u suggested…..do u know how I can avoid that for next time? Thanks for so many delicious recipes!! Do you know if it would reduce the smart points if you don’t use canola oil? I entered the info in the calculator on the website and it says they are 4sp??? The WW recipe builder and MFP don’t always match. Feel free to use whatever you like. Having trouble with the shells splitting open even when using the recommended ones. Any suggestions? Microwave your tortillas in a plastic produce bag or grocery bag and leave them in there as you are rolling. Like only take out one at a time. I don’t have luck with corn tortillas so I use the fajita sizes flour ones. These were great! To quote my son, mom these are actually really good! !